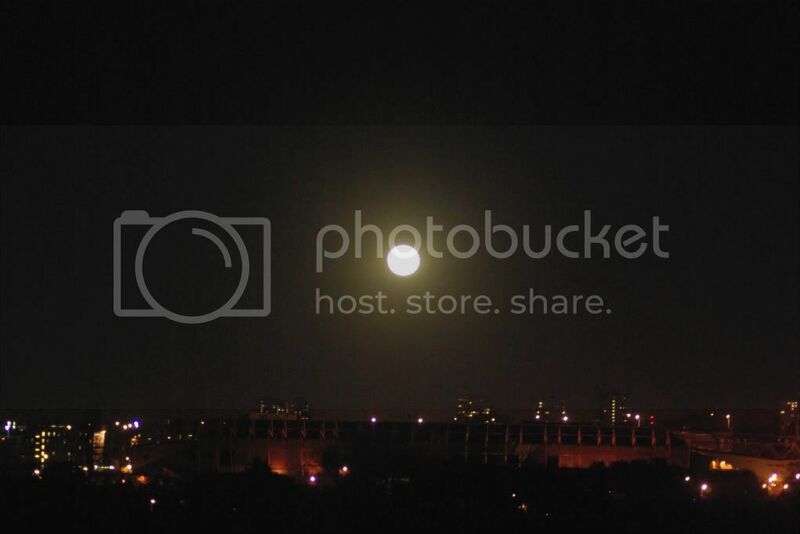 Yes, it is my very first, dedicated moon photograph. I know this is an absolutely laughable attempt, especially as it was shot from one of the most heavy industrial and lived in areas of my country, but this is my first moon picture. A day after full moon I couldn't resist opening an attic windows and shooting this. It was an out-of-hand shot with a Canon 1000D fitted with a Sigma 200mm on manual with T 1/250 and A 8.0. I did apply a slight yellow filter, a little sharpening and some added contrast afterwards with photoshop. These were taken on my Pentax K10D: the first with a Pentax 18 - 55mm lens; the second with a Tamron 70 - 300 out at 300. What did you do for time/aperture, P'ter? 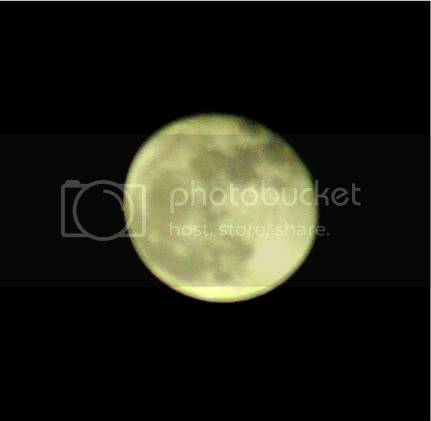 I started out with some shots on automatic but the moon just became a white blob, like in your first pic. I put it on shutter priority, set that at 1/500 and let aperture take care of itself knowing that it couldn't open wider than f5.6. Hans, that's a pretty good picture of the Moon considering it was hand held with an ordinary camera. To get a better picture you would need to steady the camera with a tripod, or better still attach it to a telescope that is tracking, or better still use the telescope. Automatic exposure will try to balance the exposure over the whole frame (depending on what kind of mode you have it set to), so it will always overexpose an astronomical picture with a bright object on a dark background. If your camera has that setting you could try a spot exposure and put the spot on the Moon. Otherwise manual is your best option. It has bth, Steven, spot exposure ad full manual. I just "asked the internet" and the settings I used were the ones generally recommended. I also read that photographing the full moon gives you flat pics because of the lighting and you do better photographing a waxing or waning moon. I'll probably try this again with several lenses and definitely with the camera on a tripod and on timed or remote exposure. Last edited by Hans; Feb 7 2010 at 04:25 AM. That's right. A half moon will look more dramatic than a full moon because the low lighting will lengthen the shadows from hills and craters and give a more dramatic edge. But it's all a question of taste - the full moon gives you a nice soft image of the maria and the half moon gives you dramatic mountains and craters. There is a Heath-Robinson way of tracking your camera on the sky without using a telescope: You take two flat pieces of wood and join them together with a hinge, so they can open together like a book. Then you arrange for the open ends to be joined together by a large screw thread. The general idea is to arrange for the wooden "book" to open and close slowly when you turn a nut attached to the screw thread. The ideal solution would be a screw thread with a handle on the end, but you could use a wing nut. Then you attach one face of this wooden "book" to a fixed object (e.g. a tripod) so that the hinge is pointing towards the north pole (line it up with polaris). You attach your camera to the other face and arrange for it to point at the object you want to photograph (while keeping the hinges pointed at the pole). Then when you open the shutter of the camera you slowly and steadily turn the screw thread so that the camera tracks the sky. How fast you need to turn the screw thread is a matter of trial and error. An alternative solution would be to make a worm gear driven drive out of meccano. That used to be a good alternative to using a motor driven telescope, although nowadays motor drives are sufficiently cheap that building such a device is hardly worth it. I'm a tad reluctant to post, given Steven's expertise . . . but, for what it's worth . . . I've found out the hard way that letting the camera determine exposure will result in failure; even with spot metering the cone of acceptance is far larger than the diameter of the moon. So the camera will try to expose for night sky and over-expose, burning out surface detail. Remember the moon itself is quite bright, reflecting sunlight as it does. shutter speed of around 1/200. Then experiment, using only shutter speed. Moon disc too dark? Try 1/100. Two or three shutter speed adjustments should give you a decent image of some sort. Oh, and the longest focal length at your disposal . . .
And a tripod, if you have one. ETA Some refinements: Use mirror lock-up if your camera provides this facility. Then use the timer to allow vibration to settle before the shutter opens. Or use a remote release.